Analog Artist Digital World: The Live Oak International. Live Oak International Grand Prix held at the pastoral Live Oak Plantation (2215 SW 110th Ave, Ocala, FL 34481), a 5,000-acre thoroughbred breeding farm located minutes from Ocala Florida, celebrated it's 25th anniversary in 2016. The combined driving event has grown from humble beginnings as a sparsely attended affair held at a small venue near Ocala to one of the largest Combined Driving events in the country. Today, the competition attracts some of the best drivers, trainers, coaches and owners from around the world. 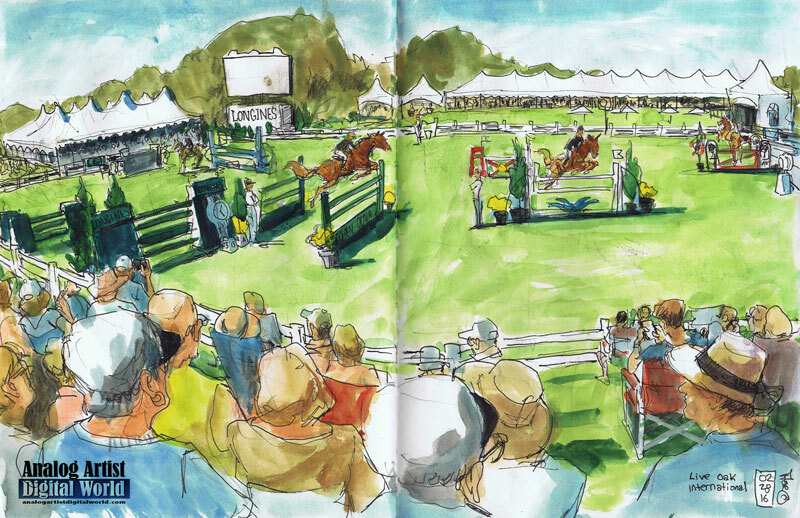 Over the years, tens of thousands have come to watch the driving and show jumping during the Live Oak International. The Show Jumping event draws top riders, including past Olympic gold medalists. Once again in 2017, the Grand Prix will be part of the Longines FEI World Cup™ Jumping North American League. The combination of the two disciplines makes Live Oak International a one-of-a-kind event perfect for the seasoned equine enthusiast and the novice alike. Was nerve wracking watching the horses jump the fences. Perfect rides with no fence posts down were rare. Of course there is only one horse and rider on the course at a time, but I couldn't resist putting more horses on the sketch as they jumped. The winner of the $35,000 International Jump Competition (against the clock) was number 175 Vasco with rider Adam Prudent from France. He ran the course at 60.24 seconds with no penalties. The next Live Oak International competition will be March 15-18, 2018. Tickets are available now.